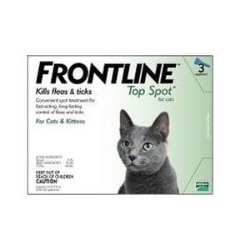 Frontline Top Spot for Cats is an easy-to-apply liquid which kills 98–100% of existing fleas on your cat in less than 24 hours. It keeps working for a month after the initial application, and remains waterproof even if your cat is bathed or swims. Kittens can be administered Frontline Top Spot for Cats from two months of age. 6 dose supply.